This new and exciting release in terms of fun racing game will surely please you as you will be going on the lake and hopefully win sone races with the jet ski. Make sure you will be hitting all those jumps to get some awesome air points and also try to collect the miniclip coins in order to further increase your high score and this way you will be setting some cool records and also have a great time. The competition will be fierce so have a fun time trying your best to win and hopefully you will become the next champion and your high scores will be awesome. 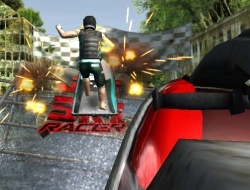 Jet Ski Racer 0.00 between 0 and 10 based on 0 votes.